This trip had started as two separate trips booked without paying any attention to the calendar. First, we booked the 3 days aboard the Dawnlight - a liveaboard departing from Tobermory, Ontario. 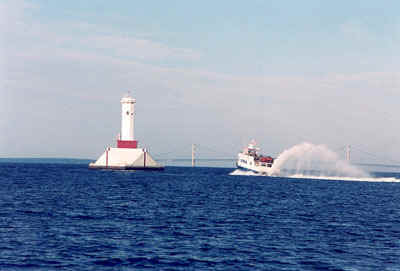 Second trip was to the Straits of Mackinac, Michigan. Closer to the date of the first trip, I realized that they were just two days apart and that spending four hours driving from Tobermory to Toronto and then nine hours to Straits was likely not the most optimal way of spending the that time. Looking at the map, we realized that there was a way of getting from Tobermory, which is at the tip of Bruce Peninsula, to Manitoulin Island, aboard the Chi-Cheemaun Ferry. From Little Current, Manitoulin, the drive to Straits would then take about 4 hours. 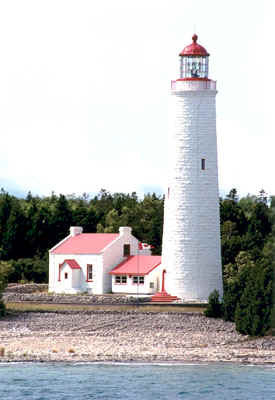 Manitoulin is best known for being the largest freshwater island in the world. It is also known as a great nature place with its hundreds of kilometers of unspoiled shorelines and beautiful lake-scapes. 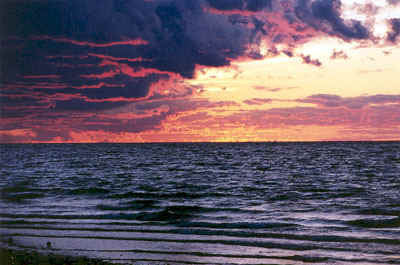 It is an island rich in native culture as well. Native people call is a "Place of the Great Spirit". I always wanted to visit but never had time. That sealed the decision  we were going to make it a one big trip! Before we got to dive the next morning, we were treated to a turning bridge show  the bridge connecting the island's town of Little Current to the mainland is too low for most of the vessels, so it makes a 90 degree turn every 30 min or so to let the boats through. 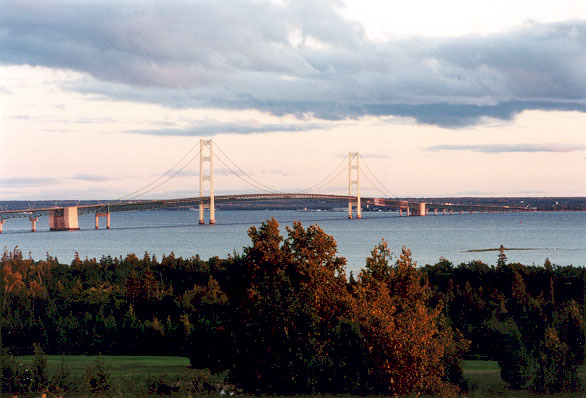 We also got to drive over this bridge in the car (several times) five days later, as it was directly on our route from Toby to Straits. Dawnlight is a great boat for the live-aboard charters  there was enough space for all our gear and there is also a compressor on board. We bought four T-bottles of O2 to put into the back gas and deco bottles, so most of the group were diving Nitrox 30% with few of us using EAN50% for our deco mixtures. Although North Wind is in the same lake as Arabia, Forest City and other Toby wrecks, it is in the North Channel, which apparently results in much warmer temperatures but as a trade off, you loose visibility. Max viz on a North Wind was probably around 25 ft. It is not that deep  only 120 ft  but because of the low viz, it is quite dark. 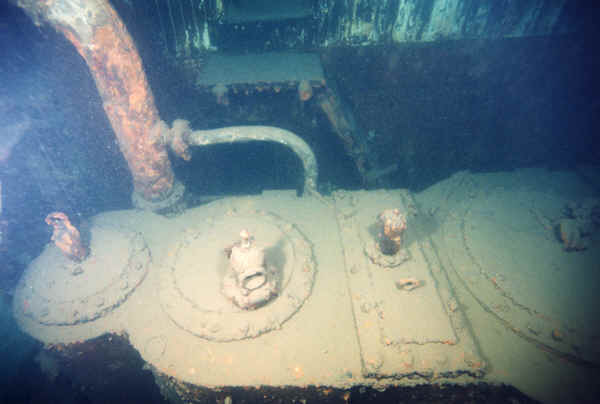 We did couple of observatory dives on the bow and stern parts of the wreck first. Then we discovered the engine room and the stern cabins - and that's where we spent the majority of the time. One easy way of getting to the engine room was through the doors on both sides of the ship that led to the hallway if you went straight and the engine room if you turned left or right (depending on whether you were on the port or starboard side). Naturally, we were not looking for easy ways ;-) and used the stern cabin entrance. 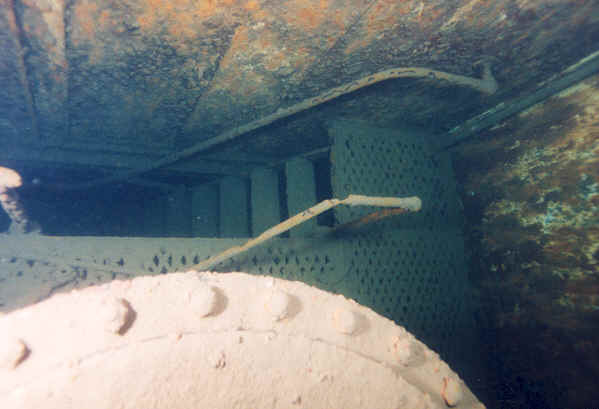 To access the engine room from that entrance point, one had to swim alongside one of the narrow hallways on the sides of the ship. The doors to the crew living quarters and other rooms opened into those hallways. The amount of silt on the floor, the doorknobs and the window frames, told me that it was not the route visited often. The space in the crew living rooms was quite tight and did not allow for camera deployment. The hallways widened as they approached the engine room and I was able to take couple pictures of the paint that is still there as well as the axe sign. The axe is still there, but I just could not get the camera to focus on it. 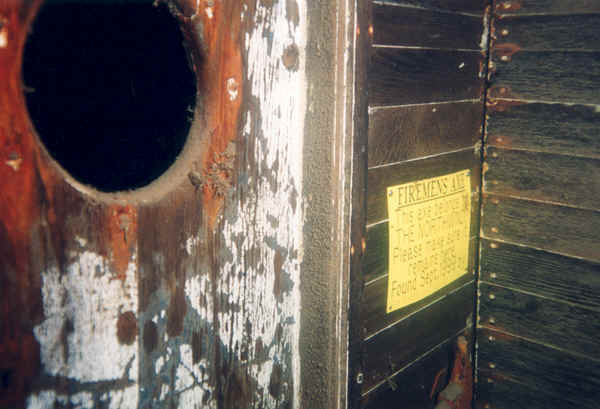 Off the lower level of the engine room was a tool room with the variety of tools and work table rusting peacefully. There was also a ladder leading further down to the lower level, but we decided not to go there with our cameras. 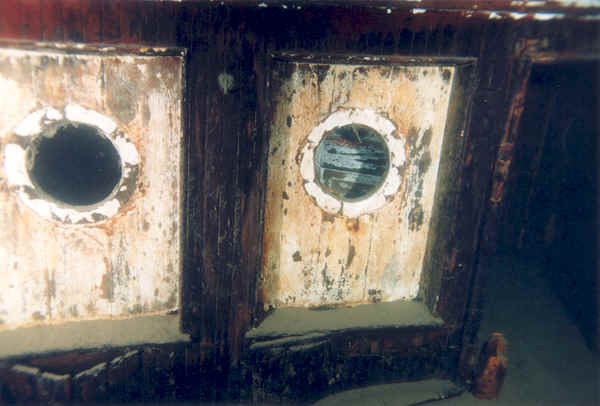 On the last dive on the North Wind, we poked around the bow area and cargo holds. In my few years of diving in Ontario, I somehow managed to avoid Tobermory completely. Talking to people about the diving there, I could not stop but hearing about the Arabia and what a magnificent wreck it was. I finally did get to dive it on from the Dawnlight  it was a nice wreck, but not as spectacular as I thought it would be. Still, the bowsprit was beautiful and intact and it was really nice the see the wood, not zebra mussels on this 100 years old wreck. And true to its reputation, it was darn cold and there was a noticeable current. Our Dawnlight trip finished on Wednesday and after unloading, we dropped the tanks to the local shop to get gas, and went around exploring the village. I was only there once before, in November, so it was really nice to see it bustling with activity. Toby is full of the little crafts and souvenirs shops as well as various art galleries. Some of the artwork was very interesting. 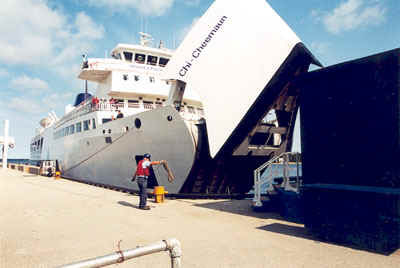 Next day, after leisurely breakfast at the place overlooking the harbor, we made our way to the ferry terminal, parked the car in line for the entrance, grabbed the cameras and ran to take pictures of the Chi-Cheemaun arrival. I believe that Chi-Cheemaun means "Big Canoe" - don't know about canoe, but it was big all right. We disembarked at South Baymouth and made our way to the Little Current, Ontario on the north shore of the island (remember the rotating bridge)- it was our home for the next day. Having settled in our hotel, we had lunch in the restaurant in the same building (highly recommend  Anchor Inn Hotel and Restaurant). Next, we set upon exploring the town and surrounding area. The plans were to visit the local waterfalls and old Indian village, but all the plans were postponed when we discovered that there was a major thing missing in Little Current  photo processing. Ever watched the two photographers who just finished a dive trip and cant get their pictures developed? Crankiness and utter desperation do not make for a good sight ;-). After asking around, we determined that the closest photo processing place would likely be in Espanola - a town 60 km away on the mainland. That meant we had to cross the rotating bridge on the way from and to the island. That bridge was originally built for rail use between Little Current and Ontario mainland. 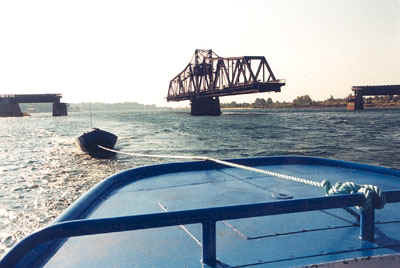 For the period of time between 1945 and 1980's, the bridge was shared by cars and trains. In 1980's the rail traffic to the island stopped and the bride was used by cars only. Original design had the bridge staying opened until the train was near. These days, it turns and stays open every 15 min on an hour. We did manage to find the place to process our pictures. Unfortunately, that was the time when I discovered that my new system had major focusing problems. Having just thrown 2/3 of my pictures away, I was not in a mood to continue exploring the island, so we called it an early night and departed the island early next day. 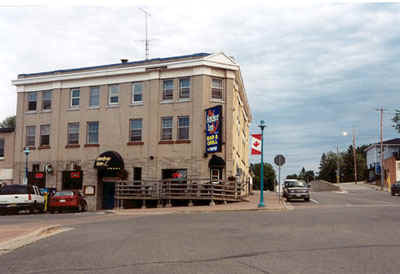 The drive to Straits (St. Ignace) was uneventful with the exception of a visit to the dive store in Sault Ste. Marie and my discovery of a coffee mug on one of the shelves that said "this body only moves for two things: coffee and diving". Anyone that knows me recognizes how addicted I am to both - that mug made my day - I was still laughing when Mackinaw bridge appeared on the horizon. We finally were at the Straits where all those wonderful wrecks awaited us! If wreck diving was a religion, Eber Ward would be my place of worship. This is my favorite wreck by a huge margin. I dove wrecks that were larger, had more glorious histories, contained more artifacts, but none of then got me mesmerized the way Eber Ward did on my first dive. Descending down to it for the first time, I thought about the story of the wreck and its sinking  it sounded quite ordinary. She was a 213' long steamer made of all wood and had a long productive life. One day in late in April 1909, she found herself fighting a loosing battle with ice in the Straits of Mackinac. The huge chunks of late April ice quickly cut the old wooden bow and the fate of Eber ward was decided  she sunk within an hour taking 5 crewman with her. Today, she is sitting in an upright position in 140' of water. The pilothouse was blown away during sinking, but there is still lots left to see. 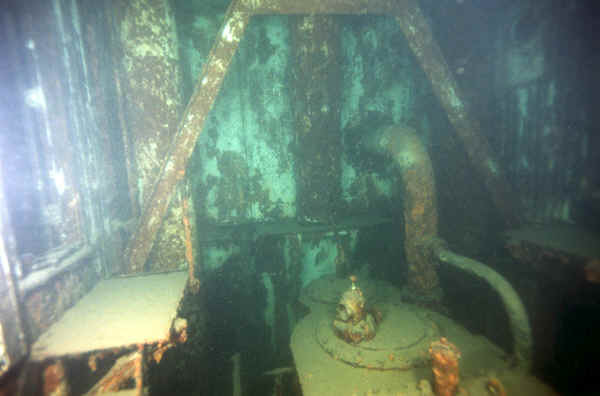 When we first descended, we spent some time playing around the prop and then decided to swim inside the middle deck. Thats when that wreck captivated both of us. Some of the side planking on that deck was missing allowing deem light from far above to seep in  creating an eerie feeling that I still dont know how to explain. I was tempted to turn off my lights and just swim with available light, but that would have meant that I would miss all the interesting artifacts that were there, like hand carts strewn around the deck or the unique loading mechanisms. Swimming through that middle deck very slowly, we kept extending our bottom time again and again until it was absolutely the time to go. We exited the deck near the bow and realized that we still had to see the anchors, bow hole (from ice) and the bottom deck. We came back the next day and did a longish dive on it again this time concentrating on the bow with all the anchors and the lower deck. We entered through the ice hole that is right under the mushroom anchor and swam around for few (too short) minutes, discovering more handcarts along the way. Then we made out way up finally having time to look at the top deck and discovering the toilet and the porcelain bathtub sitting snuggly near the guardrail. We had a second dive to do on the same set of doubles, so we had to come up, which we did  extremely reluctantly. When we were driving to the Straits portion of out North Wind-Tobermory-Straits of Mackinac trip, the 110' long brig Sandusky was the wreck that I wanted to see the most. It was a two masted brig, which was a rare type in the Lakes and that one was reportedly in great condition with intact bowsprit AND had a ram figurehead to top it off (a replica one). We had to cut our Eber Ward dive short because we wanted to ensure wed have enough gas left to complete Sandusky dive safely. Blame me, or the impact of Ever Ward on me, but I was disappointed in Sandusky  it was not the wreck that I would like to visit again. The figurine and bowsprit were nice, but the rest was just ordinary. If it were not for the figurehead, the bowsprits of Kathy Eccles or March (both in Lake Ontario) could compete with Sandusky. 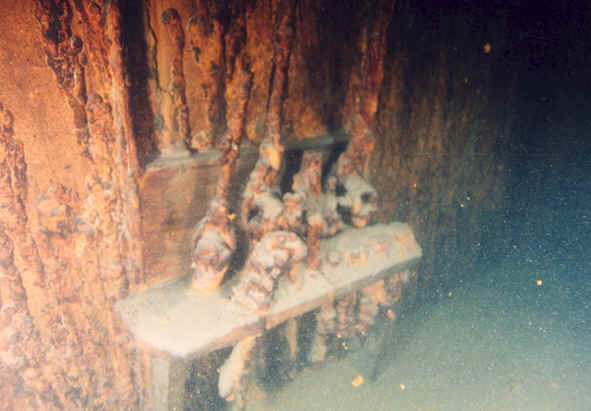 Cedarville is probably the most famous wreck in the Straits. Sunk in 1965 in collision with Norwegian vessel Topdalsfjord, this 600' long wreck is probably one of the best sites in the Great Lakes. Unfortunately, I severely injured my finger immediately prior to dive in the ladder incident, so I spent most of the dive in major pain and did not quite pay attention to the surroundings. In addition to the ones above, we also dove W. Young and Barnum - both on Michigan side of the Straits. It was probably my worst trip camera-wise - nothing worked on either system. The injured finger was not fun either. Yet, I enjoyed every second of that trip. We visited places I've never been to, met wonderful people, made new friends and seen some magnificent wrecks. That was the trip of the year for me - and I did manage to salvage some pictures in the end.